Under Executive Order 56: Reporting Suspected Child Abuse, University employees and volunteers must report suspected child abuse or neglect by telephone or otherwise at the first opportunity, but no later than 48 hours after suspecting that the abuse has taken place. To learn about changes reflected in EO 56, you may view a brief overview here. View Frequently Asked Questions about EO 56 here. Call the University of Washington Police Department (UWPD) at 206-685-UWPD (8973) / TTY 206-543-3323 or the law enforcement agency within the jurisdiction of the suspected incident if other than the UWPD. If you are concerned about the immediate safety of a child call 911. For abuse or neglect involving a parent, guardian or other household member, call the Department of Social and Health Services (DSHS) at 1-866-ENDHARM (1-866-363-4276) (TTY accessible). For suspected child abuse that occurs in a University program or at a University facility regardless of its location, University employees and volunteers must also call SafeCampus at 206-685 SAFE (7233) to report the suspected abuse immediately after they report the suspected abuse to the authorities. You will be asked to report only what you know, and are not expected to do any type of review or investigation prior to reporting. The Abuse of Children Law includes the following definitions: Child or Children means any person under the age of eighteen years of age. Physical Abuse – The non-accidental infliction of physical injury on or physical mistreatment of a child, when it may cause harm to the child’s health, welfare, or safety. Negligent Treatment – An act or failure to act, or the cumulative effects of a pattern of conduct, behavior, or inaction, that evidences a serious disregard of consequences that constitute a clear and present danger to a child’s health, welfare, or safety. Sexual Exploitation – Allowing, permitting, or encouraging a child to engage in prostitution, or obscene or pornographic depictions of a child. Abandonment- A parent or guardian foregoing the responsibility to provide essential care to a child. 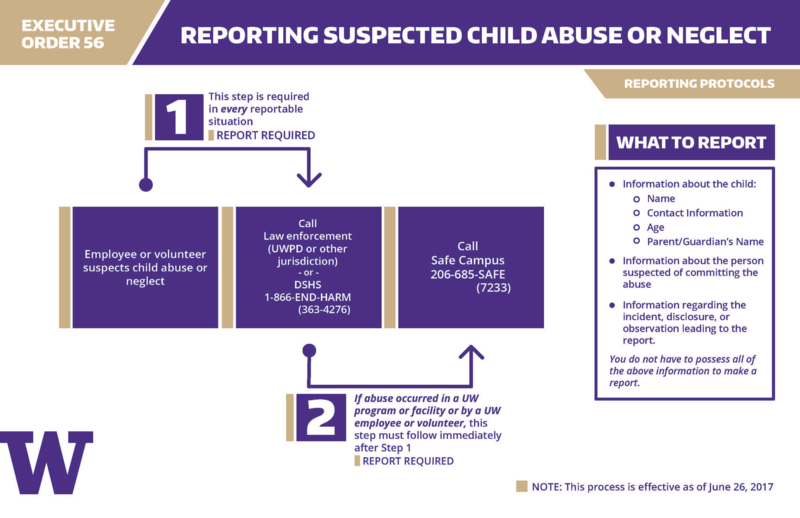 For questions regarding EO 56 or your reporting requirements, contact uwminors@uw.edu or call 206-616-5153. 2019 Summer youth programs job fair!